Advanced Home Care delivers extraordinary care to over 20,000 patients each and every day. The organization places much value on giving back to the communities it serves. On Thursday, October 15, 2009, the organization was in a position to positively impact the life of a man in Burlington, NC. An Advanced Home Care employee read an online article from the Burlington Times-News on Tuesday, October 13, and wondered if her employer could help. The story was about Charles Pennix – a man who is physically dependent on crutches and was saving up to purchase a motorized wheelchair in order to go back to school to pursue his degree in information technology. He and his mother had been raising money by selling baked goods at the family’s church in Gibsonville for the past six months. Unfortunately, the funds that Charles and his mother had raised for the wheelchair on October 13th were stolen at the end of the long day by a local thief. 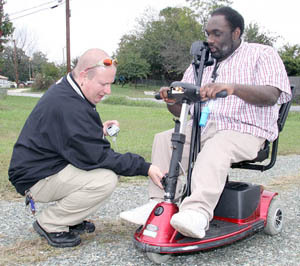 When Joel Mills, Advanced Home Care’s chief executive officer, heard this news the next day, he immediately contacted the organization’s rehabilitation equipment seating specialist to coordinate the donation of a scooter for Mr. Pennix. By Thursday afternoon, a motorized, three-wheel scooter was delivered to the Pennix home by Advanced Home Care. Click here to access the full story that was featured in the Burlington Times-News on October 15, 2009, and here to access Elon Student Television’s coverage that aired on October 26, 2009 on Phoenix 14 News.